The design of the logo is red in colour and the background yellow. These are the colors of our school. Red represents courage and righteousness, and yellow represents compassion and wisdom, manifesting the ideals of a scholar-warrior as well as the ideals of a warrior-monk. 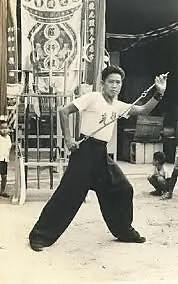 The trident and soft-whip also represent "kong" ("gang" in Mandarin) and "yow" ("rou"), indicating both the "hard" and "soft" dimensions of our training. The inner and the outer circles represent both the internal and external approaches of our cultivation, and also signify that we pay importance to both our mind as well as our body. The inner circle reminds us of the importance of internal unity, and the outer circle our universality, i.e. we spread our arts to deserving people irrespective of their race, culture and religion. In addition, note that "Shaolin" is a Mandarin translation, whereas "Wahnam" is Cantonese. "Shaolin" was chosen over "Siu Lam" (which is in Cantonese) because it is universally known, whereas "Wahnam" was chosen over "Huanan" (in Mandarin) because the names of our grandmasters, "Lai Chin Wah" and "Ho Fatt Nam" are generally known in Cantonese. This shows we can be both idealistic and practical at the same time - the non-dualistic characteristic of Zen. We are idealistic in our aspiration, but practical in our application. It also reflects that while our origin (Shaolin) was from the northern Shaolin Temple, our development (Wahnam) was from the Shaolin Temple in the south. The number three, as suggested by the trident and the three sectional whip, is important. It reminds us of the three treasures of Shaolin, namely Chi Kung, Kung Fu and Zen, and that our training involves all the three dimensions of form, energy and mind.